The week of the 16th June was a shocker in the vineyard. Hail apart – and they’ve had some of that up the road in the Loire valley – the weather could hardly have been worse. Not only is the flowering really late but it has poured during the crucial time, with potentially disastrous results for the crop. 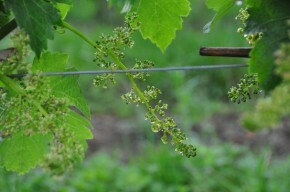 The tiny flowers are vulnerable to cold, damp weather and poor fruit set is likely, affecting quantity and quality. Here are a few stats, courtesy of Touzan who supply some of the products we use in the vineyard. St-Emilion had 56mm that Monday evening – almost the same as the appellation would normally get during the whole of June. Both St-Emilion and Léognan, which is across the Garonne and home to many other famous Bordeaux estates, had almost 100mm in four days during the floraison. That’s a veritable soaking. The table below shows we’ve had well over double the 30-year average rain in June (62mm) and, in some places, as much as three and a half times the norm. The weather during the first half of the year has been the worst in Bordeaux that we can recall (leaving aside the hail that hit us and other unlucky parts of Bordeaux in May 2009). The table shows that the cumulative rain since 1 January is around 600mm compared to the 30 year average of 445mm for the year to date. In some places they’ve had 50% more rain than usual. And it’s been much colder in May and June, just to slow the vines up even more. Still, a wonderful July, August, September and an Indian Summer in October (when the red grapes will be picked) isn’t impossible. Here’s a gallery of snaps from our vineyard. Scroll over any photo for a brief description – and if you click on any of them, you can flick through the larger versions of each picture (in a normal browser) using the arrows on the right and left of the picture. To return to the post when you’re in that mode, use the X on the top left of the screen. The rain drained away from the gravel soils but still..